Endoscopy is a medical procedure that uses a tubelike instrument called an endoscope. Current endoscopes are derived from a primitive system created in 1806, a tiny tube with a mirror and a wax candle. This instrument allowed us to view inside of the living body. The endoscope allows not only diagnosis of gastrointestinal disease but treatment as well. Endoscope using a charge-coupled device (CCD) has been used since 1983. Recently, new technologies such as a magnifying endoscopy and a narrow band image (NBI), which make special image by processing the digital image, are under development. In addition, confocal endomicroscopy was also developed to observe the cell and tissue structure of mucosal layer in real time and to perform optical tissue diagnosis. These endoscopes brought a great development in diagnosis and treatment of gastrointestinal diseases. Upper gastrointestinal endoscopy, usually called esophagogastroduodenoscopy, observes the mouth, pharyngolarynx, esophagus, stomach, and duodenum. 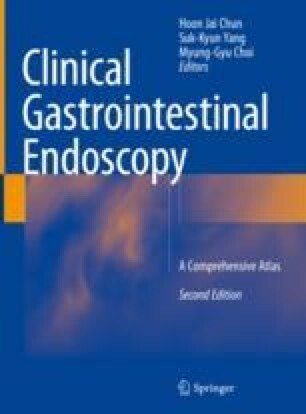 The findings and normal variants of normal upper gastrointestinal tract are to be discussed in this chapter.